Whether it is your first time or you just want to add another tattoo to your list – this collection is made to help you choose the best symbol for the summer. We have gathered beautiful, minimal and colorful tattoos that have summer motifs and will work perfectly with your bikini, kaftan or summer dresses. Get ready for a lot of stunning tattoo ideas that you will adore! Sand on your feet and the wave tattoo that peeks – is there anything else you need to be happy? Add colorful jewelry and some trendy bikini for a perfect beach look. This is a delicate place for an even more delicate tattoo. Anchor and wave – perfect summer combination! Add a little color to your waves! Delicate turquoise line inside wave will turn your summer tattoo into a head-turner one. Combining two symbols into one is a fantastic idea! You can ‘copy’ this girl’s sun-wave tattoo – it is perfect for minimal tattoo lovers. Not all the tattoos need to be black – add a stunning watercolor to your wave. Match your tattoo with your bestie! Colorful bikini and seaside with your friend is everything you will need on your summer break. If you are thinking about adding a new tattoo to your body collection, and you want that to be summerish – add a beautiful circle wave. Hawaii vibes are always welcomed in the summertime! You can opt for some famous phrase like this girl opted for ohana (in Hawaiian means family). Do you like tropical fruit? My favorites are pineapple, bananas, and passion fruit. Why don’t you turn your favorite fruits into a tattoo? Perfect idea, right? If you want something that will remind you of the place you have visited, then make this lovely postcard tattoos! They seem very interesting and fashionable at the same time! 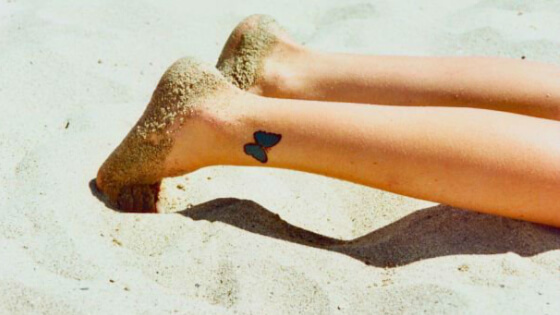 Delicate and minimal tattoos are our favorites for summertime. If you are into them too, check out this lovely palm tree on the back of the shoulder. If you liked the palm tree, then you can try it on the other place. How about the miniature tattoo on one of your fingers? As you can see, waves are very popular as summer tattoos. They can appear anywhere – it is for you to opt where you will draw your favorite summer tattoo. Mandala painting originally comes from India. Girls lost their minds over this kind of motifs, so it is not a surprise they want it as summer tattoo. You should opt for minimalistic tattoos that you can wear not only in the summertime. This girl styled her anchor tattoo with cropped jeans and sneakers. Summer tattoos can be a great work of art sometimes. This is a perfect way to show off your nature and style. Nothing is so cute as sea animals. Why don’t you put them on your wrist as a perfect summer tattoo? Mandala on your back can look perfect in combination with black bikini and denim shorts. This tattoo will seem like a part of your colorful summer pieces of jewelry. It is very delicate and minimal, but that doesn’t make it less attractive. A blue butterfly on your ankle wrist is always a good idea. It is one of the classy tattoos, and it will never be out of style. Wanderlust is one of our favorite words. If you belong to this group too and you like to travel, this tattoo will be an excellent idea for you to try out in the summertime. Challenge your inner Indian girl by choosing mandala as your summer tattoo inspiration. You can’t overdo it – put it on your hand, back or shoulder. Minimalistic tattoo in the form of a beautiful sunset is everything that you will need for your summer vacation. Make a stunning combination by mixing gold or silver sticker tattoos with your palm tree black tattoo. Spoiler alert: they will match perfectly with sun-kissed skin. Creative tattoos are really looking beautiful. You can also look unique with this crab tattoo on your upper arm. Let this plane reminds you of all the travels you have been and all that are waiting for you. Seaside, beaches or mountains – whether you choose to spend your summer break time will be perfect. Don’t stop to cruise. Summer or winter it doesn’t matter – choose this tattoo to reminds and alarm you to travel every time you have a chance. Minimal and delicate birds tattoo on the back of your shoulder is not only perfect for summertime. You will be able to show it off through all seasons. Seashell is perfect tattoo choice for summer. You can choose the best place for it. Our suggestion is to pick a wrist of your arm or leg. Let this island tattoo reminds you of your summer travels or getaways every time you see it on your wrist. If you are not a fan of big and eye-catching tattoos, then you should definitely opt for something like this. Small and delicate seashell is an amazing tattoo to go with on hot summertime. When you are opting for feet tattoos, you can never go wrong with sun, seashell or delicate wave. Make sure it is small and minimal. Tiny lines in minimalistic style and a small sun never looked better on a tattoo. Whether it is black or you add a splash of colors, your tattoo will be noticeable. There are some moments when you can’t choose – seaside or mountain vacation? If you are into both, do this kind of tattoo to show it off to everyone. If you are a fan of animal tattoos, do one in mandala style as this girl did perfectly on her back shoulder. Silver sticker tattoos look absolutely fabulous on bronze sun-kissed skin! You have to try it, it is a fantastic summer tattoo idea. On the other hand, you can’t ever go wrong with gold tattoos. Pick different motifs and mix them! Boho is on point in hot summer days, and you know what that means! Maxi dresses, flowers in your hair and lovely gold tattoos on your arms, wrists, and back. If you like to be noticed, this tattoo will leave everyone in your surroundings amazed. The floral motifs will never get old or out of style. Small but not unnoticed – this tattoo will gain a lot of amazed views, you should know that! Tiny turtle doesn’t seem childish at all! It is perfect for women with the minimalistic sense for fashion and style. This can be a quite interesting place for a tattoo! Let this anchor keep you stable on the ground. You will be absolutely unique wherever you appear with this galaxy-dolphin tattoo on your forearm. Sea animals are always a great summer tattoo idea. When you add a little bit of color, it will look even better – almost perfect for every occasion. If you are more for something not so colorful, you can always opt for this minimal gold tattoo just below your neck. Heart shaped tattoo with a lovely sun, palm tree and a wave can be your choice for summer. Choose the place – ankle or wrist are definitely our suggestions to go with. Combination of art and geometry turns out quite well with this tattoo. Pink flamingo will earn you a lot of amazed views. If you are a fan of animal motif tattoos, you should opt for this turtle. The foot is a great place to put it and make it seen all the time. Arrows on your back in combination with bracelet tattoo on your forearm can look perfect in the summer. Don’t forget to wear dresses and tops with an open back and sleeveless. We love all these fruit summer tattoo ideas. What about you? Which fruit would you choose? Sun and moon tattoos keep some meaning and can be really personal. Show them off while wearing your summer bikini. The inner side of your forearm is a perfect place to put a tattoo like this – feather is not only perfect for showing it off at the beach, but it is an amazing tattoo for all weather seasons. Do you love ice cream? If you are nodding, then you should probably turn it into your new favorite summer tattoo. Some people like their tattoos to look like real pieces of art. When it comes to flowers, pink peony is one of our favorites. You can have it as your tattoo as well. The back is the best place to go with. Opt for a word that means something to you – that inspires you to keep on going, to be creative and to live the life in the best way possible. Turquoise and gold make one wonderful summer combination. This diamond shaped tattoo will always remind you of seaside and beautiful palm trees. If a foot is a place where you have decided to put a tattoo let it be the riding wave. It seems both chic and beautiful. Small and minimal eye tattoo on your hand wrist would never make you look dull. This small watermelon tattoo on your hand will always keep you smile. It is minimal but not it will not be unnoticed. The words or phrase that is known only to you is always a good idea for your new summer tattoo. Beautiful dreamcatchers can be a fantastic tattoo idea. You can put them literally everywhere – back, arms or wrists. You can never have too many tattoos – the tattoo artists say this phrase all the time. This girl decided to listen their pieces of advice and choose a few summer tattoos. Floral tattoo style at this place on your body will make you a star of any event you decide to go. Finding balance inside your mind and body can be expressed on your tattoo as well. This fish tattoo seems so real. It looks like it is 3D. We would like to try something like this! This is a minimal tattoo, but on the great place on your body for showing off. Little anchor in combination with your striped bikini would be perfect for the seaside. How about adding some Hawaiian vibes on your arm? This red hibiscus looks so realistic that you have to try it! As we have already mentioned, this is one of our favorite words. You can now make it into a tattoo and show your emotions about travels. We all think sharks are dangerous and terrifying but look at this tattoo. It is cute, right? Give your summer tattoo a girly touch by adding flowers, lace details, colors or a delicate frame around the lovely seaside scenery. Mermaid seems very feminine, and they are a perfect idea for your summer tattoo! Let it be made of watercolors. Take your wave tattoo to the bigger level and make it looks like it is your wrist bracelet. Spread the message with your lovely foot summer tattoos!